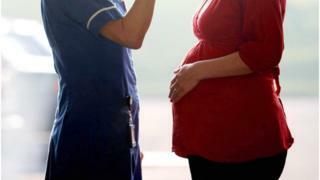 Aberdeen Maternity Hospital no longer has a midwife shortage, NHS Grampian has said. There were 28 vacancies last October, leading to the midwife unit and labour ward merging temporarily, which was described as essential but non sustainable. The midwife unit has now reopened, two months behind schedule. Charge midwife Andrea Lawrie said the safety of mothers or babies was never compromised. She told BBC Scotland: "The delay was I feel the correct decision. It was around safety. "Over the last few months we have been able to recruit midwifes. A lot of those have been newly-qualified midwives that have recently trained and we didn't feel it was the right thing to do to open the birth unit to have all those newly-qualified midwives. "So we have paid particular attention to skill mix and getting it right, and also to let those new midwives get settled in and begin to get a bit more experience."